These little cookies are notorious for the number of aliases they have. 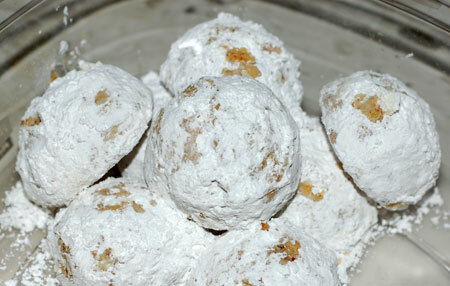 Your family may have called them Russian tea cakes, Mexican (or Italian) wedding cookies, pecan butterballs, snowballs, even Viennese sugar balls; mine called them pecan crescents, but we rarely bothered forming them into crescent shapes. 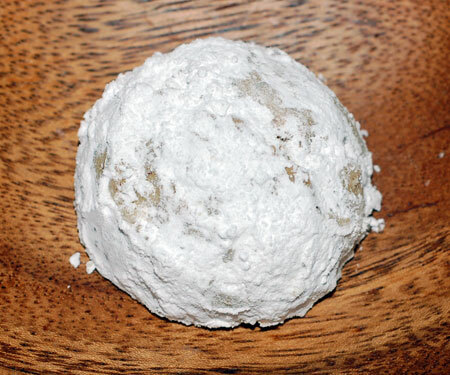 I’ve decided the most straightforward name, at least in my own mind, is snowballs, because that is what they look like to me. As with the myriad names, every recipe for these sugary confections is slightly different. Some produce a more crumbly dough than others, but through trial and error, I’ve found one that works perfectly for me every time. Since they are essentially a shortbread cookie, this year I tried making the dough in my Cuisinart, and it was ready in the blink of an eye. You don’t have to use pecans to make them—other perfectly viable options include walnuts, hazelnuts, or almonds—but pecans fit into my family tradition, so that’s what I use. Preheat oven to 350F. Place the flour, sugar, salt and nuts in your Cuisinart; pulse until the nuts are finely chopped and everything is amalgamated. Sprinkle in vanilla and pulse one or twice. Drop in the butter and pulse just until the dough forms a ball. Shape dough into about balls about 1 tablespoon each, and place on a cookie sheet. (Gosh darn it, if that wouldn’t have been another use for a 2-tsp cookie scoop ! Ah well, next year!) Bake for 20-25 min or until lightly browned. Cool on a rack, then roll them or dust them heavily with confectioners sugar. Makes 2-3 dozen.